IIB Blogs – You wanted the bicycle? Now pedal! You wanted the bicycle? Now pedal! This was my first weekend in the city as an Inter! The first week of work was over and I wanted to do something great preparing myself for a new week! So … my decision was to rent a bike and pedaling towards Williamsburg, one of the Brooklyn neighborhood. After one hour walking around Williamsburg, my friend and I decided to stop to eat something and in a minute we realized that it was a great occasion to do our first “Sunday brunch” in New York! 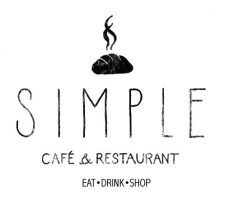 Our choice was a so nice restaurant frequented by many guys and families, it name is Simple Cafè (view the website clicking on the image). From outside I saw fantastic bagels with eggs, bacon and hollandaise sauce. Everything looked delicious and everyone seemed happy. Why not stop here?! In a few minute we sat down and we started to decide our orders. There were so many typical dishes for a fantastic brunch. So yummy! It was a strong decision, but at the end we decided for the classic dish that the waitress suggested to us: bagel with eggs, bacon and obviously pancakes with maple syrup for dessert. All was really incredible! A perfect lunch in a cool place in a wonderful sunny Sunday. 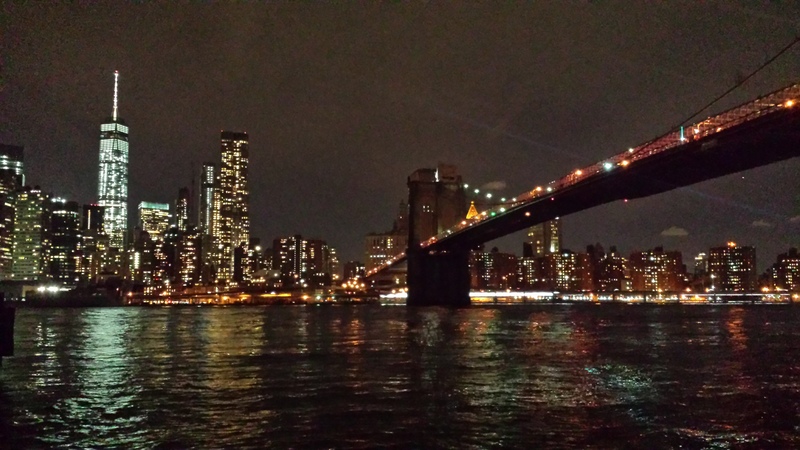 When we finished to enjoy our brunch, we decided to start a small trip along the East River: from Williamsburg to Dumbo, another amazing neighborhood in Brooklyn, exactly near to the Brooklyn Bridge. The distance is approximately 3miles, no more than 30 minutes by bike; we had time to take a lot of photos, do some shopping and explore the neighborhoods of Brooklyn before come back at home. The weather was perfect and quite warm..so, why not?! In this way we could appreciate the amazing view of Manhattan. It was like seeing a different city, with the chance to admire the beauty of its skyscrapers with much more calm and no traffic noise. In that moment I thought there could be nothing better, but I was completely wrong! In fact, at the end of our “trip”, we had a big surprise. We arrived at the Brooklyn Bridge Park in the late afternoon, when the sun was going down. The sky became red in a few minutes and Manhattan changed his appearance in short time. Around 6.30 pm all became dark and the city was turning on its light. I thought to have so much photos about that skyline, but that scenario was completely different from the previous one. It was exactly when I took my camera that I realized…that ride was comparable to all my experience of the last few months: the departure two months ago from Milan where everything seemed surreal, the path (sometimes uphill) in New Paltz where I did many things and I met new people and now … here, in New York City, for one of the most important result of my life. So now you can understand the reason why I choose the title ” You wanted the bicycle? Now pedal!”. It is a typical Italian saying and it refers to a situation where someone was dreaming of or striving for some goal/outcome, and once obtained it, he or she must to take all it entails – good, bad, overwhelming, or challenging as it may be. That is exactly what I’m living here since two months, but now, half of my experience, I look back and I understand that the climb was exhausting, but from here the view is amazing! Good luck to all my classmates and friends of IIB program.